Counterfeit phone chargers can be deadly. We’ve seen an increase in the number of incidents being reported about fake, cheap and unbranded chargers – many of which fail to meet UK safety regulations and can lead to electric shock, injury and cause fires. With that in mind, it’s important to be aware of the risks when buying a phone charger. You don’t need to be an expert to spot the difference between a genuine and fake Apple charger – our handy guide will tell you everything you need to know. Look for missing markings (like the CE mark) or spelling errors. These are the easiest way to spot a counterfeit – but beware, as fake products are becoming more sophisticated. This can be another fairly obvious indicator of a fake. The finish on a genuine charger is high quality, matte and uniform. On counterfeit chargers the finish is usually glossy or shiny with imperfections. The USB port on a counterfeit charger might be upside down, or in a different place. A genuine charger will also have a serial number at the back of the USB port. Our testing has shown that the pins on counterfeit plugs are much weaker than required by the standard. This is typically because they are metal-coated hollow plastic, rather than the solid metal used in genuine products. An easy check for this is to simply flick the largest pin and listen to the noise it makes. A genuine plug will sound and feel solid, while counterfeit products will make a ‘plastic’ noise and feel hollow. As counterfeit chargers contain few, if any, of the higher quality components required for safety, they are usually significantly lighter than genuine chargers. The charger should weigh at least 40g. 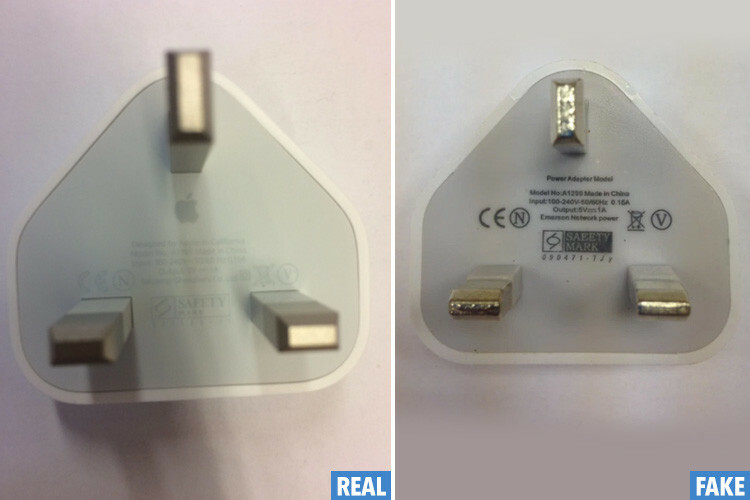 The plug pins on a fake Apple charger may be larger or smaller than a genuine one, and may be positioned in a different place. The easiest way to check is by using the Electrical Safety First plug checker tool. Check that there is at least 9.5 mm between the edge of the pins and the edge of the charger (9.5 mm is about the width of a ballpoint pen). If the distance between the edge of the pins and the edge of the charger is less than 9.5 mm, there is a risk of electric shock when plugging in and unplugging the charger from a socket. Plug the charger into a socket but don’t switch it on or connect it to your appliance. Does it plug in easily? If the charger does not easily plug into a socket, the pins may be the wrong size or length, or the distance between the pins may be wrong. If pins do not fit properly into the socket, overheating, arcing and mechanical damage can occur to both the socket and the charger, which can be dangerous. Look for a manufacturer’s brand name or logo, model and batch number. Check that the output voltage and current ratings marked on the charger and your electrical device are the same. Do not rely on a CE mark alone as a guarantee of safety – it’s simply a declaration by the manufacturer that the product meets all the safety requirements of European law, but they can be easily forged. Adequate warnings and instructions must be provided. As a minimum, user instructions should provide information on conditions and limitations of use, how to operate the charger safely, basic electrical safety guidance and details of how to safely dispose of the charger when it is no longer required. 1.8 million phone chargers are bought online in the UK each year. Unsafe devices are often made in China for as little as 3p, which means poor quality components. Sometimes these products don’t have safety features such as fuses. The UK has seen a six-fold increase in the number of counterfeit electrical goods seized over the previous four years. The value of counterfeit goods seized by councils and the Border Control rose from just over £2.6 million in 2009 to more than £15.7 million in 2012. The most-seized items were chargers. A genuine Apple charger contains over 60 individual components, while a counterfeit contains an average of just 25. Many imported chargers do not satisfy UK safety regulations and can cause serious electric shock, injury or fire. Suppliers and retailers have a legal duty to ensure that all electrical equipment they sell is safe. Registered Charity (England and Wales) No. 257376, Registered Charity (Scotland) No. SC039990, Electrical Safety First is the campaigning name of the Electrical Safety Council.